Explorations in Quilting and Life: Complete at last! Finally, after so many months, I have completed Scents of India. In retrospect, I am glad that the embroidery module quilting did not work. I feel my 'freehand' free-motion quilting really adds to the quilt. I am finding that I really enjoy using beads to enhance a work. My final step was to glue some actual seed pods from the Star Anise into the center of the map of India. Next step for this quilt will be an appearance in our local guild's bi-annual quilt show. 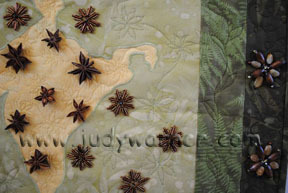 Yes, I agree, the freehand quilting adds wonderful details that finish the quilt. 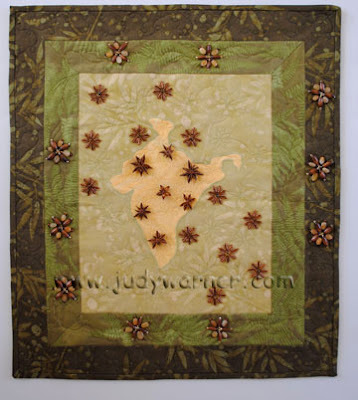 Nicely done, Judy! I like the watermark...on my list to do as well. This really turned out wonderful Judy. I like everything about it, including the photo with the watermark. I need to learn how to do that. Thanks, Linda and JW. I am going to do some blogs this coming week on reference items including watermarks. Lisa Chippetine shared a source with us in the SAQA Visioning project that I found very helpful.